“IF THERE IS no deal, is there a possibility that you would be forced to build a wall across Ireland.” That was one of the questions posed to Tánaiste Simon Coveney during a BBC Radio 4 interview this week. Perhaps what is most telling is the five second delay before Coveney answered. “No I don’t believe that is going to happen,” he replied. A week can be a long time in politics, and no more so when it involves the UK leaving the EU. Yesterday’s deadline summit came and went, and still no withdrawal agreement was signed. The sticking point? The Irish backstop. Europe’s lead negotiator Michel Barnier said today the Irish border could be the issue that sinks a Brexit deal. But a no deal Brexit would be catastrophic, as Taoiseach Leo Varadkar put it this week, not just for Ireland but also the UK. 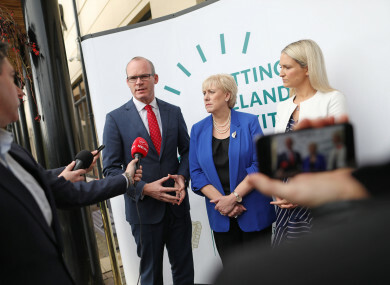 Speaking to TheJournal.ie in Monaghan this afternoon at the Irish government’s latest Get Brexit Ready roadshow, Coveney said it is his job to be “polite but firm” to the UK media, British politicians and the UK public at large when explaining how UK-Irish and Northern Irish relations work. Does he not get fed up of British commentators not being up to speed with Irish history and what is at stake for Northern Ireland? Nobody is talking about building a wall. What we have been trying to do for the last twenty years is build bridges not walls between the north and south, to create a sense of normality and that is what we need to protect – that normality… we need to protect that through Brexit and ensure that we don’t have unintended consequences that are damaging. My job is to reassure Irish people but also to explain to many British people why this issue of border infrastructure is so emotive and so important. So, what’s the state of play as it stands? Essentially, the UK wants a UK-wide backstop arrangement between the UK and the EU wants a Northern Irish specific backstop. “I think there is a way of showing some flexibility, to give reassurances to both and that is what the negotiating teams are going to focus on,” said Coveney. Despite rumours that solidarity with Ireland is wavering in some EU quarters, the Tánaiste said those rumours are not credible and solidarity between all EU members and Ireland remains strong. While another EU summit was rumoured to be taking place in November, yesterday it was ruled out. Coveney said a meeting could still be held next month, but only if the two sides make significant progress. If there is a deal to be done whereby the negotiating teams can recommend an agreement on a deal then I think there will be a November summit but in the absence of that signal from the negotiating teams then i don’t think people will meet for the sake of it. Everyone wants to get this done in November. Coveney said it could well push into December, but was firm that a deal must be reached by Christmas so as to ensure there is adequate ratification and preparation time. However, Coveney said he is an optimist, and hopes a deal can be done in the next six weeks. But he said Ireland is also planning for a “worse case scenario” Brexit and he told businesses along the border to do the same today. ‘There’s a storm a comin’ seemed to be the Tánaiste’s message to businesses who packed out the conference rooms in the Four Seasons Hotel today. However, whether the Brexit storm will bring gusts or just a slight breeze is still anyone’s guess. While the political heavyweights try and get a deal over the line in Europe, it is is the small and medium businesses that have to prepare for all eventualities. Coveney told the crowd today that “it is a little bit like preparing for Storm Callum”. We had this storm coming across the Atlantic and no one really knew how powerful it was going to be in terms of flooding and wind, but people were getting their sandbags ready just in case… they were preparing for a significant flood even though they hoped it would never happen. It didn’t happen, but this is a little bit like preparing for storm Callum, we don’t quite know what it is going to look like, we hope its going to pewter out but we have to get the sandbags out there. Email “Tánaiste: 'Some in the UK don't seem to get it. Nobody is talking about building a wall'”. Feedback on “Tánaiste: 'Some in the UK don't seem to get it. Nobody is talking about building a wall'”.